Amer Catic is a mechanical engineer who received his PhD in 2011 focusing on knowledge management and product lifecycle management in product development processes. 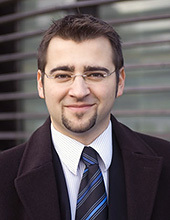 His current research focuses on knowledge management and lean product development in global companies. The aim is to set forward methodologies to enable the use of lean product development methods (e.g. visual planning, PULS, A3s, engineering checklists) without being collocated. The methodologies should integrate not only information management but also knowledge management. There might be more projects where Amer Catic participates, but you have to be logged in as a Chalmers employee to see them.